Ahh the early 1970's… What a weird transition from the previous decade, and nowhere was this better illustrated than in the film industry. The traditional storylines hadn't changed much, but the approach to telling a story did. It became darker, more cynical. It wasn't just the big studios that brought this transition of visual language to the masses via films like Bonnie and Clyde or The Wild Bunch, but the little studios too. During the last days of the B-picture that same darkness and cynicism spooled out among the second features. From Roger Corman's biker epics to the first blaxploitation films and fading spaghetti westerns to the newly emergent Hong Kong film industry, the audiences of 1971 could catch a heaping helping of nihilism at a Friday night Drive-In or Saturday Matinee. Of course, the social factors leading to this sea change in entertainment fall immediately in line with the quagmire of the Vietnam War. Since everyone could watch real-life horrors on TV every single night, and just about everyone knew someone on their way to, back from, or buried in Southeast Asia, Hollywood had to appeal to that growing war weariness. So what the hell does this have to do with a movie named Werewolves on Wheels? Like Bonnie and Clyde and The Wild Bunch, Werewolves on Wheels forces the audience to spend a lot of time with, and therefore empathize with, a bunch of scumbags. In this cast, the biker gang, The Devil's Advocates, and, unlike, say, the gangs in Corman's Hells Angels movies, The Devil's Advocates aren't really rebelling against anything. They just sort of are. And like all of the b-movie bikers before them, The Devil's Advocates are dirty, hairy, drunk, stoners who, aside from being unidimensional, take their names from their most obvious personality archetype. Therefore, Adam (Steven Oliver) is the gang leader, Tarot (Deuce Berry) is the shaman of the gang, Mouse (Owen Orr) is a little hairy fella, Movie (Gary Johnson) speaks in impressions of WC Fields and John Wayne, and finally Scarf (Barry McGuire) wears a scarf. The gang travels the dusty highways of the American west but have no set destination. Stopping briefly to drink and frolic in the shadow of an old church, the gang is offered bread and wine by the mysterious monks there. Before you can say "Satanic mass borrowed from Anton Lavey", Adam's girlfriend, Helen (D. J. Anderson), is named Satan's Bride. The gang, drunk and drugged, staggers to their feet and storm the church. With their number restored, The Devil's Advocates head back out into the wilderness. But something's wrong now. Adam and Tarot are constantly bickering, and on their first night since leaving the monks, someone murders two of the gang. Adam suggests that the pair were too stoned to make their way among the jagged rocks and fell to their deaths where a coyote chewed up their corpses. They gang heads off again and sets up camp in a junkyard. Movie is killed that night while on watch. By now the gang is starting to wonder about Adam's leadership and his complete inability to believe any of the signs and portents as pointed out by Tarot. By now we're an hour in and narry a werewolf has made the scene. 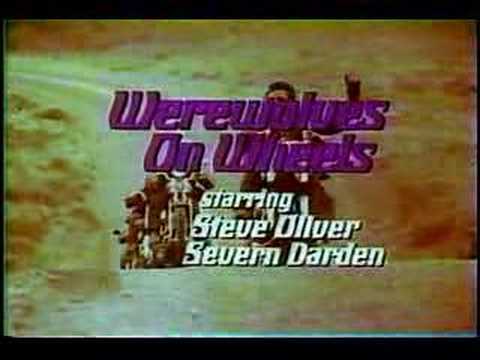 In fact, the most frequent scenes in Werewolves on Wheels are scenes of the gang riding their bikes. The film contains a total of, maybe, 20 minutes of dialogue and plot, the rest of the time we get to watch The Devil's Advocates cruise this way and that. It's shot well, but can't possibly hold our interest as long as it's expected to. I have a theory though as to why this is. See, I am pretty sure the film was targeted at the teenage crowd and since they are expected to spend much of the movie in lip embrace with their respective dates, the dialogue would only serve to sever said lip lock. And no one wants to piss on someone's make out session, right? By the time we get to the werewolf bit of the film in the last three minutes, no one will care what the hell happened before. I know I didn't. The werewolves are in the old Jack Pierce mold; that is mask and gloves and lots of snarling, but it lacks all of the established mythos associated with the monster. No wolfsbane, no silver, no full moon. The werewolves simply appear among the sleeping bikers and start to eat them. The bikers then set the werewolves on fire and kill them. The cinematography is quite good, in some places extremely good, and the direction isn't shabby. The acting is better than you would expect in one of these movies, certainly better than anything Peter Fonda did with Corman. Steven Oliver already had 6 years in the business before taking the role as Adam, two of those roles in Corman biker flicks, so he was already better than familiar with the genre. Deuce Berry was also very good as Tarot, and though he only made this one film, could have and should have had a much longer career. The release from Dark Sky films is a beautiful 1:85:1 widescreen presentation with Dolby Mono (the same as the original soundtrack), a commentary track with the screenwriter and director, a trailer, and some original radio spots. So sit back with your date, throw some popcorn down, and start smooching. Werewolves on Wheels is 79 minutes long, so that means about an hour of make out time!